and Minister charged with the administration of "The Historic Sites Preservation Act"
Tradition states that this was the gravesite of "Ia-char-ke", a Dakota elder of high esteem, who had died many years prior to 1896. All that remains of the site today is the 0.5 metre-wide by 1.5 metre-tall pointed stone grave marker. Ia-char-ke’s remains were removed and reburied at a nearby Dakota reserve to ensure their safety. The Arrow River Standing Stone is unique. No other First Nation gravesite in Manitoba is marked with a stone monolith. 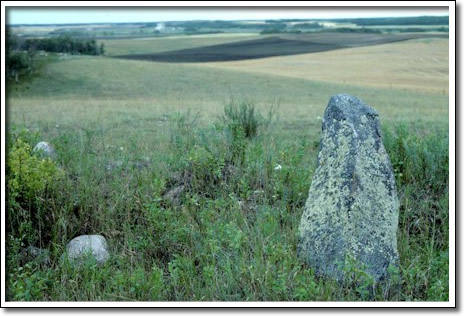 Arrow River Standing Stone Burial Ground is on the southwestern slope of a high hill at the northern end of the Arrow Hills, and overlooks the Arrow River. Dr. Ralph D. Bird, formerly of the Dominion Entomological Office in Brandon, initiated preservation of the site in the 1940s. He recalled that when his father homesteaded the property in 1896, a large stone was lying beside the gravesite. At that time, local Dakota (Sioux) visited the site annually to commemorate the individual who was buried there.